The Coles Door Systems team combines decades of experience in garage door systems for the Greater Ellington, Connecticut area. Over the years, we have expanded beyond our humble beginnings, growing into a thriving business that serves local homeowners, contractors and builders alike. Today’s homeowners recognize the enormous benefits of a high performance garage door. That’s why we recommend Garaga garage doors to our clients. They are the most energy efficient, and the most beautiful. Come see our many traditional and carriage house styles, perfect for any home. Our full selection of residential and commercial overhead doors is also available online in our image gallery. Our experienced sales team would be delighted to help you select the garage door that is right for you. Stop by our beautiful showroom at 105 Windermere Avenue in Ellington or call us at 1-877-545-DOOR. Looking for a quick quote? Complete our online form to receive a free, no-obligation estimate. Whether you are building a new home or replacing an existing garage door, your project just isn’t complete without an overhead door opener. Quality is important when it comes to operating the heaviest movable part of your home. At Coles Door Systems, we have the best brand of door openers on the market: LiftMaster. We have been installing and servicing LiftMaster openers for many years. Manufactured by Chamberlain, we know that this brand is built to stand the test of time. LiftMaster openers tend to breakdown less often – which makes our customers happy. And if a repair is needed, Chamberlain has the best selection of replacement parts. We carry a wide range of residential and commercial grade overhead door openers. They can be installed on most garage door models, and are customizable with many innovative, high-tech accessories. To learn more, please see our door opener page, or contact our team. With over 30 years of experience, we’ve seen it all. If it involves a garage door, we can do it! Our team can carry out all overhead door installation, repair and maintenance. We also offer preventive maintenance programs. We will make sure your garage door system is safe and reliable. At Coles Door Systems, we take pride in our work. We strive to give each client a positive, professional customer experience. We have worked hard to build and maintain our positive reputation, and pledge to continue to offer top‑notch service. 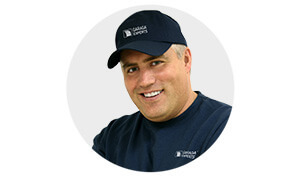 And thanks to manufacturers like Garaga, we know we are providing our clients with the best possible products. Visit us at 105, Windermere Avenue, Ellington, CT, 06029 or call us at 1-877-545-DOOR. Proudly serving Ellington, Willington, Mansfield, Vernon, Manchester, Glastonbury, Hebron, South Windsor, Eastford, Willimantic, Windham, Hampton and surrounding areas.